Thanks to a devoted community, Webmaker has grown substantially over the years. And with growth often comes change. Webmaker resources for making and teaching the Web are evolving. Mozilla Learning set out in 2015 to greatly improve both Webmaker educational tools and programs, and reach even more learners across the globe. This means giving each learner the ability to flourish independently. By granting Webmaker tools and community programs separate space, names, and attention, Webmaker can ensure they become even more potent resources for teaching Web literacy and improving the open Web. On the learning programs front: Webmaker has recently launched teach.mozilla.org, a new home for those interested in teaching the Web. 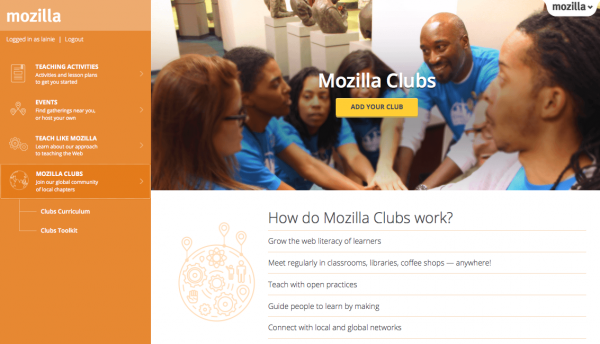 Here, educators and activists can find teaching activities, guidelines for hosting events, and information on Mozilla Clubs, a new initiative focused on teaching Web literacy to small groups of learners that meet regularly in classrooms, libraries, coffee shops, and anywhere else. The new site is still evolving and you can expect more activities, resources, and tools to be added over the next few months. The launch of the new Webmaker means there will be changes to the current suite of Webmaker tools: X-Ray Goggles, Thimble, Appmaker, and Popcorn Maker. These tools have been critical to so many Webmaker mentors around the world, and Webmaker is devoted to continuing their legacy through our new educational resources. And as always, Webmaker will work with the community to ensure this evolution is as smooth as possible. Below are plans for updating the existing Webmaker tools. To receive ongoing news about this process, check this space or email us directly at info@webmaker.org. X-Ray Goggles is one of Webmaker’s most popular and useful tools for teaching the Web—it’s been a major hit at Maker Party events and other workshops and programs around the world, and was developed out of Webmaker’s city learning lab, Hive NYC. Starting soon, X-Ray Goggles will be available on teach.mozilla.org. Here, users will still be able to install X-Ray Goggles to inspect and remix the code of their favorite web pages. And educators can keep X-Ray Goggles as a core part of their curriculum. Publishing new makes with X-ray Goggles will still be possible, but as Web standards have changed some pages have protections in place that do not allow for key components to be modified and therefore published. Currently, Webmaker recommends that you identify specific pages to confirm that they allow for publishing before building your curriculum around them. X-ray Goggles will evolve to cope with these new Web standards soon. Professor David Humphrey from Seneca College in Toronto will work with his students to further enhance Thimble’s user experience and functionality, and make it an even better teaching tool. Humphrey is an active developer and longtime educational liaison with the Mozilla Foundation. He’s worked alongside Webmaker for years, and plays an ongoing, cardinal role in integrating open source practices with digital education. He’s won accolades for his work with Mozilla. 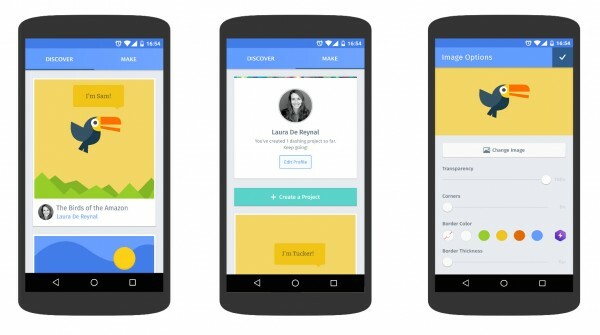 Appmaker’s chief capability—designing apps and content with an intuitive, Lego-like building system—will be a core function of the new Webmaker. Users who built awesome creations with Appmaker can continue to carry out similar work with the Webmaker app, using more fun and creative tools. Popcorn Maker is open source and dear to our hearts. Webmaker built Popcorn to push the envelope on what is possible with HTML5 and open video. In that spirit, we’d love to see both that code and community live on and continue to evolve. The code is available in github, and we encourage you to reach out to popcorn@mozilla.com if you’re interested in working to chart Popcorn’s future. In Popcorn Maker, existing makes will be available long-term in a read-only state. These will degrade with the evolution of the web and third-party services like YouTube, and Webmaker will no longer invest to maintain their compatibility. In all cases, it is strongly recommended that you visit the gallery today and jot down the URLs of your favorite creations. Existing Webmaker users’ makes will be indexed and made available to all users. Webmaker would love to hear your questions, comments, and concerns as they improve resources for teaching and building the Web. You can direct your messages to @webmaker on Twitter, or by email. For information on learning programs and the new teach.mozilla.org website, please email Mozilla. Start by visiting the gallery and saving links to your favorite makes. Then, head to teach.mozilla.org to explore Webmaker’s new learning communities resources.